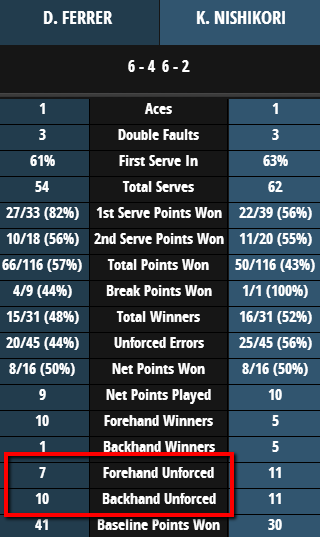 The other day, as I was watching a random Miami match, I wondered aloud on Twitter about how interesting it would be if we could get a statistic that tells you what percentage of forehands hit in a match don’t result in unforced errors. Simple idea, no? As we know, the ATP MatchFacts don’t give you any info on forehands and backhands. And just since Indian Wells does TennisTV give you a number for forehand unforced errors and one for backhand unforced errors. We do know that Hawk-Eye can tell how many forehands and backhands a player hits during a match, but I have no access to that data. Hence, why not count forehands and backhands myself, and use the unforced error numbers that TennisTV gives me to come up with that stat I want? 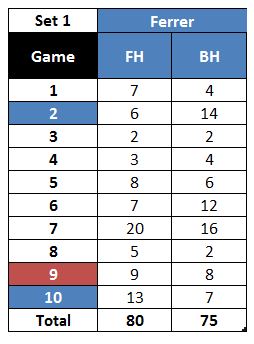 I counted forehands and backhands during each game, and wanted to create totals per set. 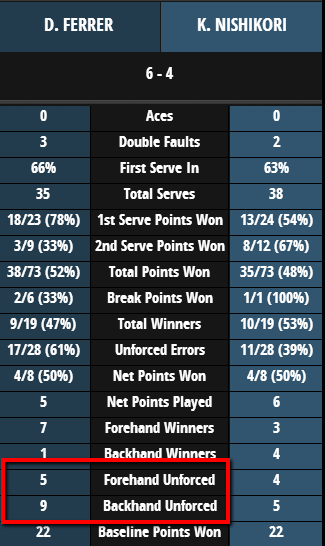 I didn’t tally my own unforced error count, as I mentioned above, and took the TennisTV unforced error count at the end of each set. So, according to our simple formulas from above, we can gather that in the first set, David Ferrer had a Forehand Efficiency Rating of 93.75%, and a Backhand Efficiency Rating of 88%. Those are pretty great numbers, no? This is why David Ferrer is a top 5 tennis player: he barely makes any mistakes. The hilarious part of that first set, of course, is that Nishikori actually had 6 fewer unforced errors than Ferrer, and still lost the set. The unforced error count for the second set would be: 2 forehand unforced errors and just a single backhand unforced error for David Ferrer. 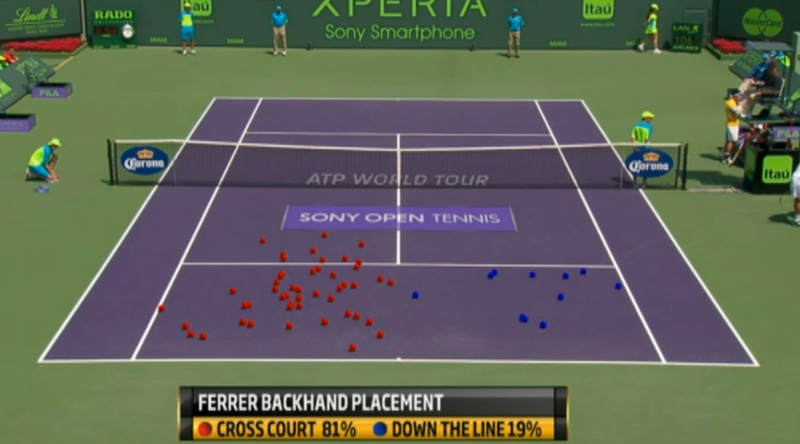 Thus, David Ferrer had a Forehand Efficiency Rating of 96%, and a Backhand Efficiency Rating of 97.8% in the second set. That’s staggering. It simply means David Ferrer makes 5 forehand errors per 100 forehands attempted, and makes 8 backhand errors (the backhand being his weaker wing) per 100 attempts. This is incredible when we consider that this was a live M1000 match against a quality opponent. Now…go back and look at my scorecards for sets 1 and 2. Do you spot a pattern? 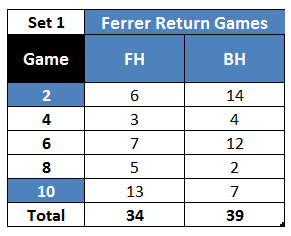 As you can see, Ferrer hit more backhands than forehands in 2 of those 5 return games. 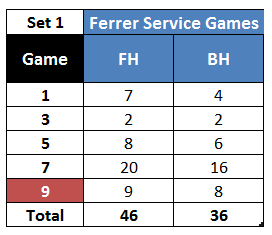 The trend is somewhat similar in the second set, where Ferrer hit more forehands in 3 of his 4 service games (in the remaining service game he hit as many forehands as backhands), and hit more backhands in 2 of the 4 return games (one of the four return games was also a tie between forehands and backhands). Why did this happen? Because Nishikori was trying very hard to play to Ferrer’s backhand corner throughout the match, give how good his own two-hander is. You can see that serving would facilitate this plan, given that Ferrer’s returns would normally let Nishikori pick which side he wanted to hit to with the first groundstroke of the rally. The Japanese Number 1 wisely tried as hard as he could to avoid forehand rallies, focused as he was on finding Ferrer’s backhand. And naturally, this was harder to do during Ferrer’s service games, since the Spaniard would almost always look to hit a forehand as his first shot after a serve, regardless of his position on the court. We know that Ferrer loves to run around his backhand and fire inside-out or inside-in forehands, and he tried to do that as much as he could today. 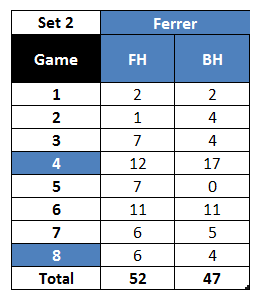 Finally, it’s interesting to see that David Ferrer hit just 5 more forehands than backhands in the first set, and the same applied to the second set. That’s minimal – the equivalent of a point or two. No surprises here: everybody knows Ferrer doesn’t like to hit the backhand down the line all that much – even though Ferrer strangely tried to pretend otherwise during the Acapulco final. Now, this is graph is fascinating. 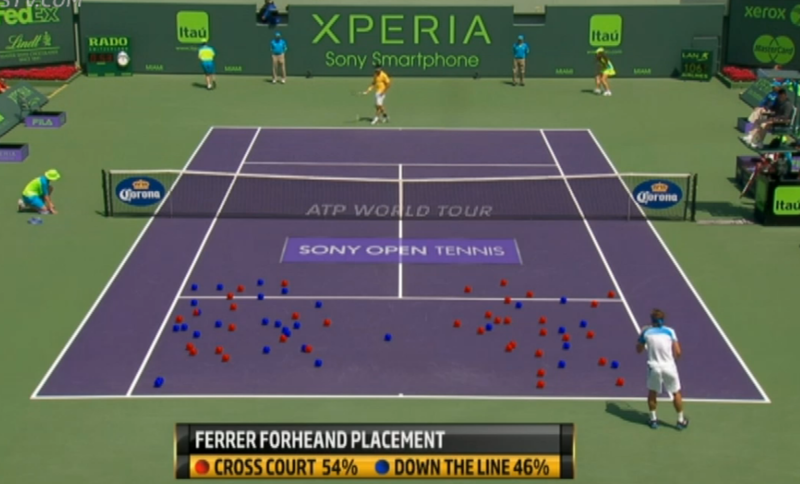 Look at how often Ferrer chances the direction of the ball with his forehand! And yet…Ferrer makes an error on only 5 out of 100 attempts with that shot. Like I said above, that’s the kind of efficiency you need to make it into the top five. This post is EPIC! I salute you Juan Jose. And your striving need to improve understanding of the game and breaking down metrics. Thanks a lot, Mithi! Glad you liked this. I second Mithi. Just absolutely fantastic work you are doing, Juan Jose. Keep it up! Love the podcast too! This is off the subject of your post, but I remember you mentioning on a previous podcast about Christian Garin. He played the qualies at a Challenger in Guadeloupe but didn’t make the main draw. Looking forward to more of your work! Thank you very much for the kind words, Aaron! Glad you hear you liked the podcast, too. And thanks for the Garín update, too. Kid will have to play a lot of those anti-climactic Challenger qualies in the next few years. That’s the first step of the grind that is becoming a professional tennis player. Hopefully he comes out of the process with some valuable experiences, along with the hunger needed to keep climbing.